Home to eight diverse neighborhoods, all easily walkable from the city’s numerous hotels and must-see attractions, Santa Monica is a haven for shopaholics. Whether you prefer big name brands or global couture, high street fashions or independent boutiques, you have plenty of options when it comes to retail therapy in this sunny city. Plus, Santa Monica’s one-of-a-kind souvenir stores don’t disappoint either. From unique home goods to curated gift items, locally-made art to specialty toys, browse some of its most distinctive stores, and be sure to leave town with a memento you’ll always treasure. Looking for a made-in-Santa Monica gift with real wow-factor? Look no further than 23rd Street Jewelers, co-owned by sisters Diane Allen and Mary Kelley, and known throughout the region for its unique, handcrafted jewelry designs. Make a beeline for their charming little house at Wilshire and 23rd, and browse the one-of-a-kind collection of earrings, bracelets, bridal couture, and more. Spanning eight acres at the heart of Santa Monica, Bergamot Station is Southern California’s largest art gallery complex and cultural center. Located on the former site of LA’s Red Line Trolley Stop, today its vast warehouse features numerous contemporary art galleries, a cafe, a frame shop, and more. 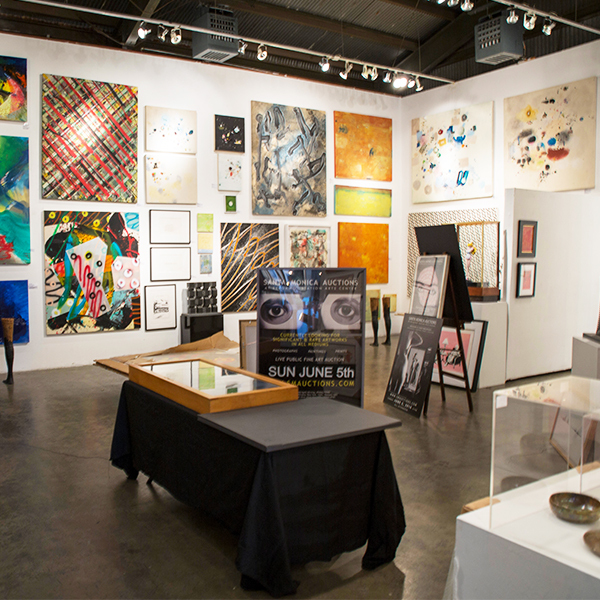 Browse the unique works of art for sale in its independent galleries. South of Pico Boulevard and just a few blocks from the beach, Main Street is home to many independent stores with an eco-friendly angle. One of them is Mindfulnest, known throughout the city for its locally made art, gifts, jewelry, and more — all lovingly made by local designers and artists. Whether you’d like to pick up a birthday gift for a loved one back home or simply want something special to remember your vacation by, this is your place. 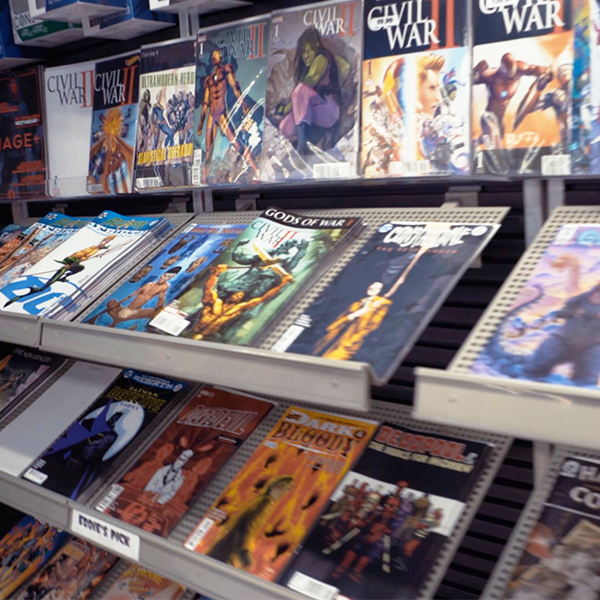 LA’s oldest comic book store, family-run Hi De Ho Comics is a must-stop for all sorts of rare collectibles — from back issues and graphic novels, to magic cards and board games. Whether you’re after a comic fix, a hard-to-find back issue, or an unusual gift for the kids back home, you’re guaranteed to find something memorable amongst its impressive collection. Plus, it’s friendly, welcoming atmosphere makes it easy to spend more time than you’d planned here — not to mention if you time your trip to coincide with one of its special events. 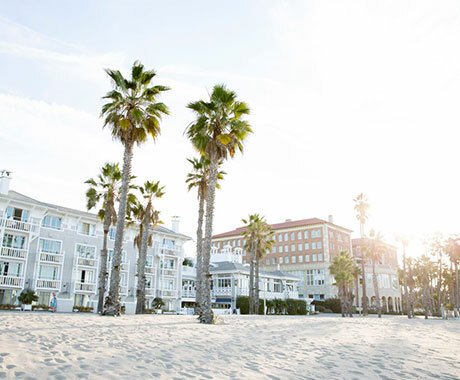 No souvenir shopping trip would be complete without a leisurely stroll down Santa Monica’s Montana Avenue – home to 10 blocks of shops and cafes, including uniquely California store Limonaia. This curated gift store features beautiful handcrafted goods from around the globe, each inspired by the owners’ world travels. From one-of-a-kind jewelry and tableware, to fun soaps, cashmere throws, and handbags — you’re sure to be inspired as you browse its distinctive collection. Another Main Street staple, Lost & Found has two stores located along this stretch: one sells independently-designed clothing for men, women and children; the other — Lost & Found Home — specializes in a thoughtfully curated selection of home goods from local and global artisans. This is your go-to spot for homeware with heart. Set at Santa Monica’s westernmost point, the Santa Monica Pier is an iconic local landmark, packed with family-friendly activities, restaurants, stunning ocean views, and — of course — plenty of shops. 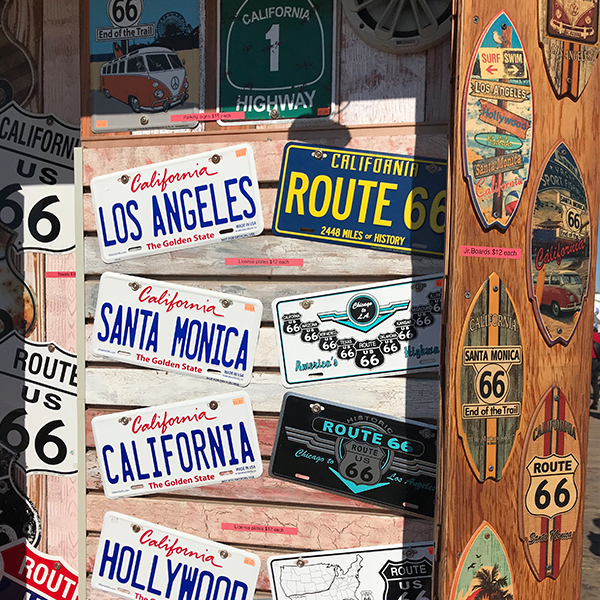 Browse a wide collection of Santa Monica souvenirs at the Pier Shop and Visitor Center; pick up Route 66-themed keepsakes at 66-to-Cali; take some beautiful shells home with you from Oatman Rock Shop; and find all of your beach needs covered at Marlene’s Beachcomber. You’ll have that gift list checked off in no time! 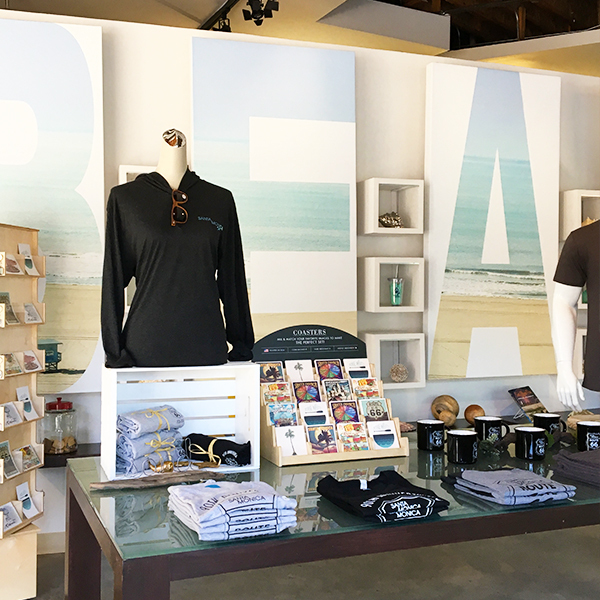 A must-visit on any Santa Monica vacation, the Main Street Visitor Information Center offers free visitors guides, maps, foreign language services, and ample information on everything from attractions to dining out to entertainment. 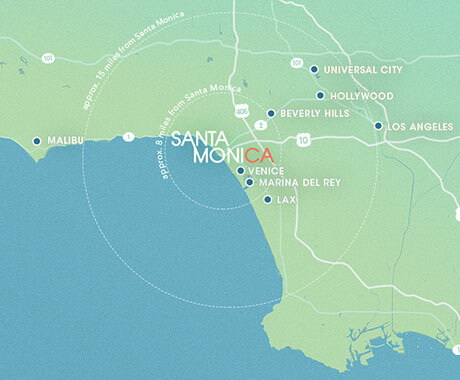 Plus, its distinctive selection of Santa Monica gifts and souvenirs makes it a great place to shop. And, if you’re not able to make it in person, all of this and more is also available on its online store, Shop Santa Monica. One of Downtown Santa Monica’s most stand-out independent outlets is The Acorn Store — a specialty toy shop selling eco-friendly wooden toys, plus a creative collection of boy’s and girl’s dress up, books, and dolls. Whether it’s a doll house or a handcrafted figure, its toxin-free collection is perfect for kids of all ages — and it’s a pretty magical place to explore too. Surf, skate or bodyboard enthusiast? Don’t leave Main Street without visiting iconic surf and skate store, ZJ Boarding House. Starting off as a hole-in-the-wall surf shop back in 1988, its passionate team have been sharing their love of surfing and skateboarding for more than 30 years, making it one of the best places in town to pick up new gear — along with plenty of friendly, expert advice.